As readers may recall, on June 5th listeners to the BBC World Service radio history programme ‘Witness’ heard that the Lebanese civil war began in June 1982 – and that Israel started it. The day after that programme was aired BBC Watch submitted a complaint to the BBC on that issue but to date has received neither acknowledgement nor a response to the request to correct that obvious inaccuracy. Moreover, on June 11th that same report by Simon Watts was recycled in its entirety (from 10:09 here) in another BBC World Service radio history programme – ‘The History Hour’ – where the item was described as being about “an assassination attempt that sparked Lebanon’s war”. As in the previous programme, listeners heard an archive recording of a news bulletin. As was noted here previously, remarkably BBC audiences did not hear a single word about the additional – and highly relevant – background to those plans and Operation Peace for Galilee. However listeners to ‘The History Hour’ did hear an addition to Watts’ report from an interviewee he was keen to present as “respected” and having “accolades”. Once again BBC World Service audiences were not informed why Sharon would have needed plans to “get the PLO out” of Lebanon. They were told nothing of the fact that the PLO had thousands of terrorists – including foreign mercenaries – based in Lebanon at the time and that Palestinian terrorists had committed hundreds of attacks against Israeli civilians in which 29 Israelis had been murdered and over 300 wounded in the eleven months before June 1982 alone. Despite earlier having told listeners himself that the Lebanese civil war began in June 1982, Watts did not appear to notice that American-born Rami G Khouri contradicted his claim – or that he whitewashed Palestinian terror attacks such as those in Ma’alot and Misgav Am by describing them as “clashes”. Listeners next heard Khouri misrepresent the circumstances of the founding of Hizballah while using the term ‘Palestine’ contrary to BBC guidelines and seeming to claim that Lebanon is “part of Palestine”. Listeners then heard a monologue which went completely unchallenged by Watts despite its blatantly partisan and often inaccurate portrayal of the first Lebanon war. Israeli forces of course fought armed Palestinian terrorist militias in southern Lebanon – not “helpless Palestinians”. While Khouri carefully avoided stating directly that Israel was responsible for Sabra and Shatila, he certainly steered listeners in that inaccurate direction. Khouri continued – deliberately failing to distinguish between the armed Palestinian terrorists expelled from Jordan in 1970/71 and from Lebanon in 1982 and the ordinary Palestinians who were not “driven out” of either country. In Khouri’s one-sided narrative there is of course no place for the thousands of Israelis murdered by Palestinian terrorists and no mention of Hizballah’s endless violations of UN resolutions. Despite this extended version of Watts’ report including ‘Israeli’ and ‘Palestinian’ points of view, it by no means gave BBC audiences a balanced account. While Gideon Argov was asked primarily about the attack on his father’s life, Rami Khoury was given free rein to promote inaccuracies and falsehoods to enhance his partisan narrative. That would have been bad enough in any BBC show but in one that purports to provide audiences with “historical reporting” it is obviously unacceptable. Despite that synopsis, listeners actually hear very little about the substance of Ali’s criticism of Arab regimes and the Palestinian leadership and even less about how that may have been connected to his murder. They do however hear promotion of the familiar context-free narrative of displaced Palestinians with no responsibility for or connection to the events that resulted in their displacement. The 1931 census shows that the village concerned – al Shajara in the sub-district of Tiberias – had at the time 584 residents: 556 Muslims and 28 Christians – but no Jews. A similar demographic make-up appears in the 1945 census. In contrast to the idyllic impression created by Ali, the villagers of al Shajara frequently attacked their Jewish neighbours in the moshava Sejera (known today as Ilaniya) during the ‘Arab Revolt‘ that began in 1936. Contrary to the impression given by Last, the fighting did not break out after and because of “the creation of the State of Israel” but had begun well before that event took place following Arab rejection of the Partition Plan in November 1947. Listeners are not informed of the all important context of the infiltration of the Arab League’s ‘Arab Liberation Army’ into the Galilee in early January of 1948 and the series of attacks it launched against Jewish communities in the region, including the moshava Sejera. The fighting in Naji al Ali’s village of al Shajara actually took place on May 6th 1948 – eight days before Israel declared independence. The narrative of passive victims with no responsibility for the conflict that saw them displaced is then further promoted by Ali. Audiences are not informed that – despite the impression they may very well have received from Last’s portrayal – the Sabra and Shatila massacres were carried out by a Lebanese Christian militia. The programme ‘Witness’ purports to provide BBC World Service audiences with “the story of our times told by the people who were there”. All too often, however, we see that when the story relates to Israel, narrative takes priority over history. News of a serious deterioration in the health of former Israeli prime minister Ariel Sharon prompted the appearance of an article on the subject on the BBC News website’s Home, Middle East and Europe pages on January 1st. Titled “Ariel Sharon’s health suffers ‘serious deterioration’“, the report offers a link to a profile of Ariel Sharon – updated on January 1st 2014 to replace an older version – from which many of the biographical details in the report appear to have been taken. In fact, the idea of an anti-terrorist fence was first proposed by Yitzhak Rabin a decade earlier and in 1995 Rabin appointed the Shahal Commission to study such a proposal. As Palestinian terrorism against Israeli civilians reached new heights in the second Intifada, a non-partisan grassroots group called ‘Fence for Life’ was formed which urged the Israeli government to construct a protective barrier. Eventually, overwhelming public opinion caused the Likud government headed by Sharon which had previously opposed any such move, to begin construction. The BBC’s claim that Sharon “initiated” the construction of the anti-terrorist fence is hence at best a very partial and selective representation of the facts. 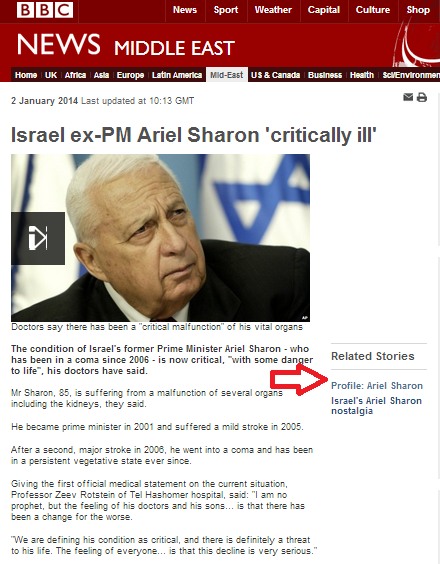 On January 2nd, that article was replaced by another at a different URL titled “Israel ex-PM Ariel Sharon ‘critically ill’“. In that report, which has undergone several changes since its initial publication, a better presentation of the context of the First Lebanon war and the reasons behind the construction of the anti-terrorist fence is provided. 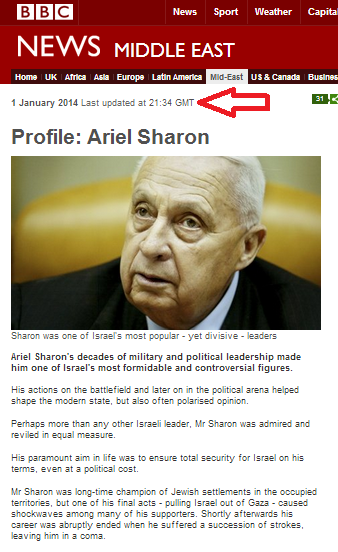 As can be seen in the screenshot above, that article also links to the newly updated profile of Ariel Sharon which – despite its recent amendment – features repetition of the long-promoted BBC myth that the second Intifada began because of Sharon’s pre-coordinated thirty-four minute visit to Temple Mount in September 2000. “In 2000 Mr Sharon paid a controversial visit to the holy compound in Jerusalem known as the Temple Mount to Jews and Haram al-Sharif to Muslims. That BBC myth has been previously addressed on these pages and readily available statements by numerous Palestinian figures relating to the fact that the intifada was pre-planned have been presented. Especially in light of the fact that it appears that this updated profile may sadly be put to considerable use in the near future, it should be immediately corrected.